(Phys.org) -- Ever see ringlets of sunlight playing in the shadows of a tree or a fiery ring of light in the sky? These incredible effects are the results of an annular solar eclipse like the one that occurred when the moon passed directly between the sun and Earth on Sunday, May 20, 2012. The event was viewable from Japan all the way across the Pacific Ocean to midway through the United States. Because the moon travels on a slightly tilted orbit compared to the plane of Earths orbit around the sun, eclipses do not occur every time the moon comes between the sun and Earth. However, there are two points or "nodes" when the moon does pass through this plane. If either of these nodes coincides with a new moon (when the sun is illuminating only its far side), a solar eclipse will occur. If a node is reached during a full moon, Earth will block the suns light, casting a shadow onto the moon causing a lunar eclipse. An annular eclipse occurs when the moon is too far away from us to completely cover the disk of the sun. This results in an annularity: the ring-shaped outline of the sun that can be seen surrounding the dark new moon. Because of the surreal look of the "ring of fire," annular eclipses are some of the most impressive celestial events visible from Earth. This eclipse passed over some of the U.S.s most famous national parks with the full annularity visible from 33 parks, while an additional 125 parks witnessed a partial eclipse. The NASA Lunar Science Institute (NLSI) at NASAs Ames Research Center, Moffett Field, Calif., and the National Parks Service took advantage of this rare event and joined forces to facilitate safe viewings for as many people as possible. Several NLSI scientists traveled to the Grand Canyon National Park and used the superimposition of our two most prominent celestial objects as an opportunity to explain to several thousand visitors about some of NASA's past, current and future projects relating to the sun and moon. These include the Lunar Atmosphere and Dust Environment Explorer (LADEE), which will orbit the moon in order to characterize its atmosphere and the lunar dust environment, and the Interface Region Imaging Spectrograph, (IRIS) which will make detailed measurements of the flow of energy and plasma through the sun's atmosphere and heliosphere. The NLSI team gave presentations to three full-house audiences in the parks theater and hosted an exhibit in its main visitor center. Samples of moon and Mars rocks and meteorites that people could handle were on display, as well as a model of a LADEE. "Multiple missions to the moon in the past five years have revealed our nearest celestial neighbor is a fascinating place," said NLSI director Yvonne Pendleton, who spoke at the event. "The Apollo-era views, rich in geological insights from samples that continue to be studied today, have been enlarged to reveal detailed topography, composition and a bombardment history that will fascinate researchers for many years to come." More than 2,000 people viewed the eclipse at the event. Safe viewing equipment was also sent to other national parks and another public viewing was held by one of the NLSI teams at the University of Colorado football stadium in Boulder, where 10,000 people viewed the partial eclipse. "Nature has provided us with a unique opportunity to capitalize on the huge public interest in the sun and moon," said NLSI Director of Education and Public Outreach Brian Day. "It is an excellent opportunity to engage with the public and explain what we are doing at Ames." 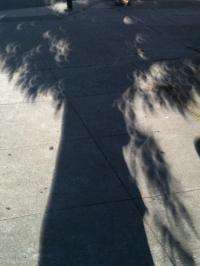 Although there have been a number of partial eclipses in recent years, May 20, 2012 was the first time in 18 years that we have been able to see the moon pass directly across the center of the sun from the U.S.